This gets two bats purely because I like the death by worm scenario and there’s so few of them out there. That said, I have to wonder if some of the people involved in Tremors were involved in Mongolian Death Worm because it was a hair short of being a rip-off of the Tremors franchise. That said, they did do a good job with the visuals on the worms – but they were still pretty darn close to Tremors style. Couldn’t find a character that I related to and most of them were flat. Books & movies can get away with many plot flaws with me if their characters are engaging – this cast just didn’t do it. 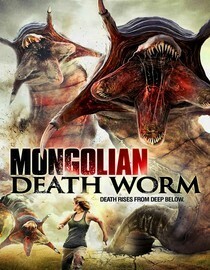 If you enjoy deadly worm movies this might be worth watching if for nothing else than to see people devoured by worms. If squirming death isn’t your bag – I’d take a pass on this one.